The alarming incidence of oral cancer connected to oral infections caused by the human papillomavirus, HPV, should rightly raise concern. For too long healthcare has overlooked the potential of HPV to cause serious disease in the oral cavity, the pharynx and larynx. Fortunately, early detection is key, and there is now a highly sensitive test that can identify early HPV infections called OraRisk ® HPV. OraRisk ® HPV identifies the HPV infection often before any clinical symptoms can be seen, and before the most serious complication occurs, cancer. If a person tests positive for a high-risk type of HPV, there is often ample time to carefully monitor what will happen next. Importantly, the majority of persons who initially test positive for oral HPV will find they have a negative result upon retesting about a year later. The question then becomes, where did the HPV go? HPV is a DNA virus, which will infect a cell, where it can reside quietly in the nucleus sort of “going along for the ride.” A person’s immune system will work to keep that infected cell(s) from growing, and typically, no lesion will ever appear. We call this state of the HPV infection, dormant. 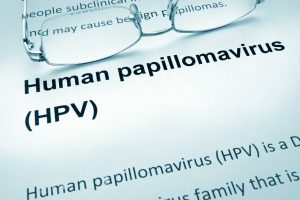 More specifically, the molecular drivers that would cause HPV to replicate within the nucleus and infect adjacent cells and grow into a papilloma or some other type of “lesion” are usually kept in check by the person’s immunity. When this happens, the level or copy number of the HPV is very, very low. So low, that even a sensitive molecular test may not be able to detect the HPV DNA. For individuals who experience a series of test results, which go from positive to negative, are at a very low risk for progression of that HPV infection. By contrast, when our immune system is slow to keep that HPV infection in check, that first positive HPV test result might, after about 1 year, be positive on the second test as well. When that occurs, and when the same HPV type is found on that second test, we refer to that condition as persistent HPV. This happens in about 1% of initial tests that are positive, so in fact it is quite rare. Testing again, in yet another year, the majority of these persistent infections will convert to negative, where they will, most likely remain. When it comes to the counsel of patients concerned about oral HPV the approach is simple; detect early, retest in about a year and note that there is very likely plenty of time to act on the uncommon event, a patient with a positive test progressing to a lesion. Remember, it’s a numbers game, and the odds are in the patient’s favor. But nevertheless, to use an old phrase: Test, Don’t Guess!